They strum, hum and literally bend over backwards to entertain passengers and passersby in BART stations and on trains. 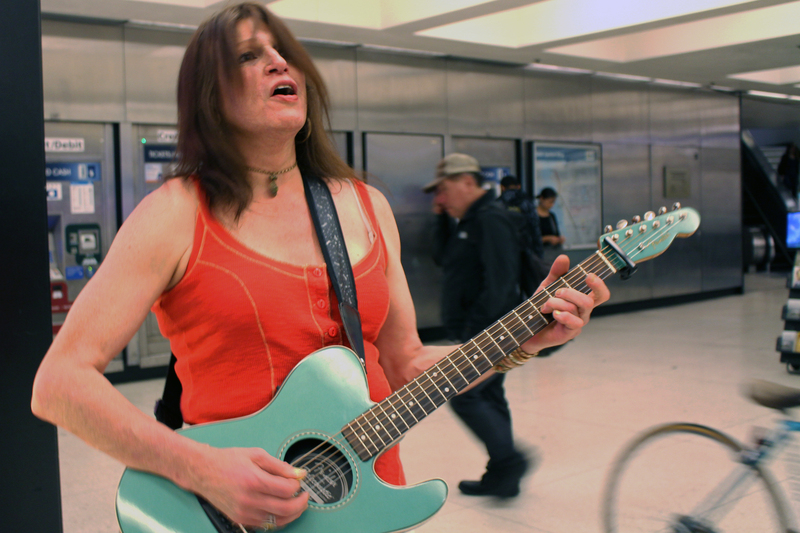 For buskers, hurtling trains are a stage; preoccupied commuters an audience. The Bay Area’s busking scene is as colorful and multifaceted as the Bay Area itself. 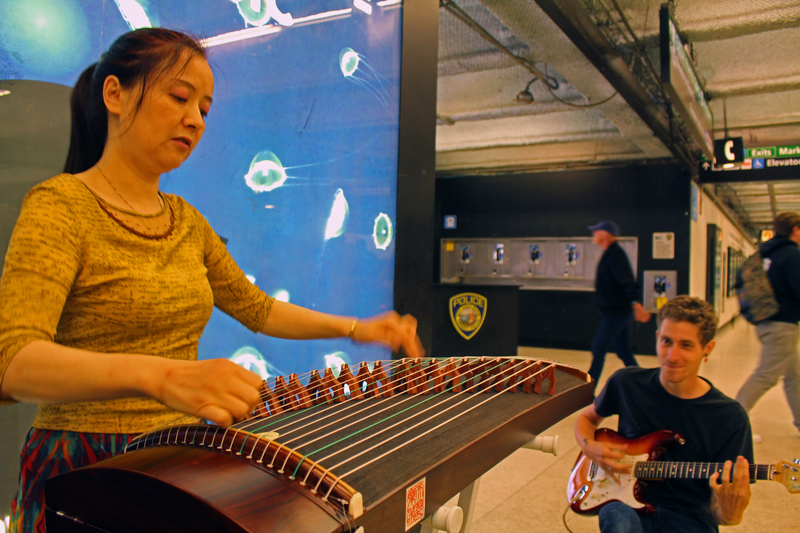 Weeks of journeys on the trains and stations of the Bay Area Rapid Transit District yielded dozens of encounters with buskers – the impromptu musicians and acrobats who entertain commuters for spare change and handouts. Some are lonely guitarists, their songs forlornly bouncing between station pillars. Others travel in packs, roaming the trains and peddling entertainment for a buck. Some are shiftless drifters; others are dedicated students. Their talents vary widely. A few are accomplished performers; others can barely carry a tune or bust a move. Simpson wrote that the status of street performers rose and fell over time, from the relative affluence of minstrels in the 12th and 13th centuries, who benefited financially and socially from association with their royal patrons, to modern day buskers, often regarded by the public as nuisances and miscreants. Carvel “Velo” Crane and Chris “Carmu” Davis are TURF dancers. Their dance style — an acronym for Taking Up Room on the Floor — originated in Oakland in the early 2000s and gained popularity as it was adopted by Oakland’s “Hyphy” rap movement, an up-tempo style of hip-hop. Crane and Davis are part of a group of TURFers soliciting BART passengers for donations in exchange for a rollicking show. The dancers’ impromptu performances are as much contortionist feats as they are dance routines, and their in-your-face moves burst the personal space bubble surrounding BART patrons. Each dancer has his own style, they said, and these two seem to enjoy being in the air. Davis treats BART’s handrails like gymnastic bars and he’s airborne for most of his performance. He hangs from the rails by his hands and feet in a spider-like stance, his green tank top falling to reveal stony abs. Crane spins across the floor in circular patterns before jumping up to land a few upside down moves on the ceiling. Loose black pants and T-shirt flow around his spinning limbs, his baseball cap somehow stays perched on his head through barrel rolls and upside down spins. Chris “Carmu” Davis hangs from handrails on a BART train while Kaing Tay (left) and Carvel “Velo” Crane (right) watch. The dancers perform a style of dancing called TURFing, an acronym for Taking Up the Dance Floor. Both young dancers said they practice constantly. Crane invented a new move as he waited for a train, a succession of twisted limbs creating geometric patterns in the air. Davis was a shy young man, and he credits his BART performances with forcing him out of his shell. He was raised in San Francisco’s Hunters Point and now lives in Antioch with his sister. His performance earnings pay most of the bills, he said. The young dancer no longer has a day job and relies mostly on TURFing for income. He struggles sometimes, but life is fairly stable, he said. Crane stays in Marin and Oakland. He says TURF dancing supports him entirely. Kaing Tay, a member of Crane and Davis’ TURF crew, showed off a thick fold of $100 and $20 bills that the TURFers had made dancing. “BART dancers could be having this anytime,” Tay said. 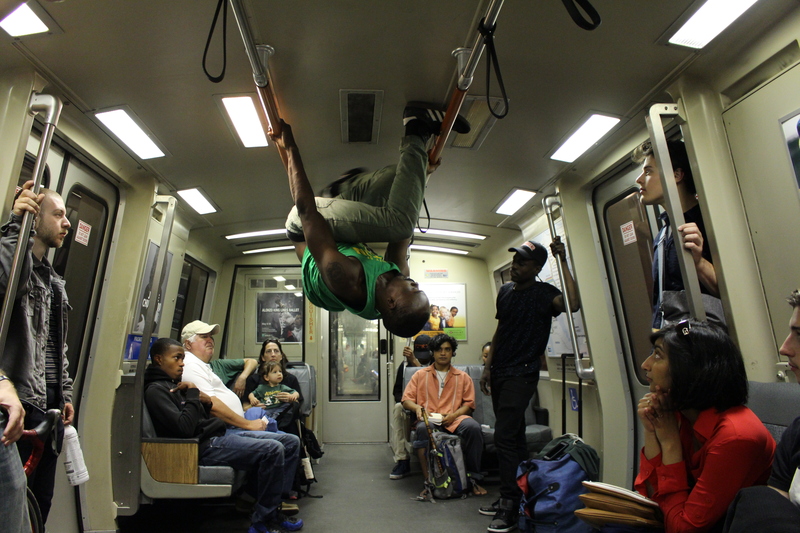 For the TURFers, TURFing on BART is only a small part of an underground culture of dance battles and public performances. The dancers estimated there were around a dozen TURF dancing groups that perform on BART. “People live off of street shows. It feeds some people,” Crane said. Davis said the pair were recently recruited for a Gap commercial, so things may be looking up for them. But buskers who stand on the sidelines waiting to be noticed can have a hard time making ends meet. Tamera Chance was raised by conservative parents in small-town Idaho. When she turned 18, Chance escaped to Seattle and learned to play blues guitar. Next came New York, Detroit and finally San Francisco. Now she picks out twangy blues riffs in BART stations and on street corners, hoping passersby will toss her enough change to get a burger and a coffee. Chance is homeless. She couch-surfs with friends, who she says are indispensable to her survival. They let her store gear and shower at their apartments. Thanks to them, Chance has never had to sleep on the streets. “I told myself I’d kill myself if I ever have to sleep outside,” she said. The guitarist refuses to reveal her age. Her chestnut hair frames a face that suggests she’s middle-aged. She wears a loose red top, tan shorts and high-heeled sandals. One of Chance’s first memories was realizing she was different. At that time, she was considered a “he.” She had a different name. Family and friends saw her as a different person. Her identity began to shift during her teens, she said, and she soon realized it was time to leave home. It was a lonely time for her. Buskers don’t usually play on a stage, so interactions between audience and performers are common. Most people give positive feedback, Chance said, recalling a favorite busking spot where her talents were regularly praised. Hecklers, however, can ruin a performer’s day. Chance remembered an incident when a person driving by said to her “You should kill yourself.” She had already been having a rough day. The remark killed her spirit. But life has a way of coming full circle. Those nearby who had heard the remark were quick to comfort her, saying that the problem was with the heckler, not Chance. Starla, Valerie and Dustin Breshears Jr. are siblings. Starla plays the cello; Valerie and Dustin play the violin. They dress as if they’re playing a concert hall: Dustin wears a sharp-edged suit and scarlet sash, Starla and Valerie lacy white tops and dark skirts. Their shoes gleam under the Powell Street BART station’s fluorescent lights. Mozart’s Serenade No. 13 is a breeze for the trio. They pause and beam confidently at an adoring crowd before beginning the next piece, but their smiles are hurried and they seem impatient to start playing again. Valerie, Starla and Dustin are 8, 9 and 10 years old, respectively, and they’ve been learning their instruments for six years. Most weekends, their father, Dustin Breshears Sr., drives them to San Francisco from their small house on a Chico cul-de-sac to busk. The young virtuosos are students at the San Francisco Conservatory of Music, an elite music school with small class sizes and big costs. Tuition for pre-college students at the Conservatory starts at nearly $9,500 per academic year, and electives can cost as much as $1,200 per seminar, according to the school’s website. The elder Breshears said he and his wife, Julie, had struggled to pay the steep tuition until their son devised the solution to their fiscal woes. On a trip to San Francisco, the younger Breshears noticed someone singing on the sidewalk. People were tossing money into a hat at the singer’s feet, and he appeared to be making good money, too. The young violinist suggested to his father that he and his sisters do the same. They were much better performers than the singer, and could make more money, he said. Dad was resistant at first, but the younger Breshears persisted, and last year, when a family friend suggested that they try busking by San Francisco’s Westfield Mall, the elder Breshears relented. Their first performance was a hit. “In a little bit of time, they filled up their cases (with money),” the elder Breshears said. 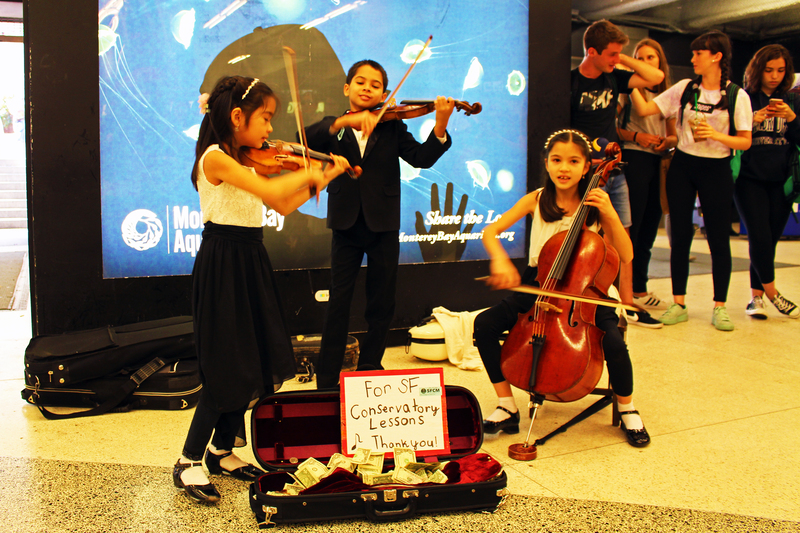 The trio began playing the corner in front of the mall regularly, but eventually moved into Powell Street BART station for the better acoustics. But playing Mozart in a BART station isn’t all coattails and high society. “People try to steal stuff from us,” Dustin Jr. said, describing an incident when someone snuck bills out of their case while they played. The elder Breshears worries for his children’s safety when they come to the city and keeps a close eye on them while they play. He periodically stuffs their earnings into a spare violin case to keep them safe. He declined to share how much his kids make per performance. BART station agents and police seem to keep watch on the trio as well. The money that was stolen from them was returned the next day after agents identified the thief and reported him to BART police, the elder Breshears said. Friends of Melody Yan say she’s a world-class musician. Yan plays the guzheng, or zither, a Chinese harp played horizontally on a stand. Its origins can be traced back 2,500 years. Yan was born in Chengdu, a city in China’s Sichuan province. She learned to play the guzheng from a master harpist in Shanghai. Five years ago, she moved to San Francisco’s Sunset District to pursue a career as a musician. Yan was introduced to percussionist Barry Despenza and guitarist Andrew Boylan about a year ago by her agent, Boris Goldmund. Their initial meeting was fruitless, but several weeks later Despenza and Boylan found Yan playing harp in a BART station. Boylan recognized Yan and struck up a conversation with the harpist. The three have been playing together since. They play contemporary rock songs and modern takes on traditional Chinese ballads. Yan’s favorite is their cover of Deep Purple’s “Smoke on the Water.” She grins, delighted, rocking back and forth in a traditional Chinese dress as her hands flutter across the harp strings. Despenza and Boylan play along, their youthful pep playing backup to Yan’s mature sincerity. Despenza plays the cajón, a box drum played by sitting on the instrument and tapping its sides. He lives in downtown San Francisco and is a graduate of the San Francisco Art Institute. He picks up occasional gigs as a freelance sound designer for theater productions, but work is spotty, he says. “I’m probably the most unstable one,” Despenza said, smiling. Both Yan and Boylan have regular day jobs. Yan gives harp lessons at Exploring Music, a music supply store and school. Boylan, also a graduate of the San Francisco Art Institute, lives in West Oakland and works as a barista in San Francisco’s North Beach. But he says the Bay Area’s magic has begun to fizzle and he’s planning to return to his home town of Cincinnati. Though he doesn’t look forward to living with his parents again, the 21-year-old busker says it’s just a temporary stop. He doesn’t know where he’ll go afterward. They may not pack stadiums on the professional circuit, but Bay Area buskers certainly have their own flare and funk to them. They have become an integral part of the BART experience. Dazzling dance moves and fluttering harp chords can give BART riders full-fledged performances or bothersome background noise. Commuters are encouraged to dog-ear their books, pocket their phones and take a moment to enjoy the next performance they see. The busker’s story may be more interesting anyway. This entry was posted on July 30, 2017 by Bay News Rising and tagged bart, blues, buskers, Chinese Harp, dancing, ghuzang, guitar, live music, music, musicians Bay Area, street performers, TURF, zither.